FINANCING AVAILABLE! OWN THE SADDLE OF YOUR DREAMS! We are concerned you get the saddle that really fits you and your horse. We will go out of our way to assure you are happy. Custom/Special order saddles may have a 20% restocking charge deducted from any merchandise credit. You can purchase and really use a saddle from us for 30 days: and still return it for exchange/merchandise credit. 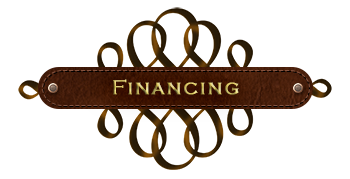 We here at Pegasus® Butterfly Saddles believe that you should never have to settle for a lesser saddle, which is why we offer financing on all our saddles. We offer multiple financing options from in-house to PayPal's Bill Me Later. For only $75-$100 a month, you can be the owner of one of the finest saddles in the world. Easy! Simply click the link “Get Financing” on checkout and you will be taken to another website where you complete a short application. That’s all there is to it! CALL OR TEXT US AT 203-246-8013 FOR MORE INFORMATION. It takes 5 to 15 hours of riding to really know how well a saddle fits. What if you do not love your new saddle after that? We know purchasing a saddle is a big expense. We also know the concerns that go along with that purchase. Will it fit? Will I be comfortable? What do I do if I don't like it? Am I stuck with it? While we do not offer cash or credit-card refunds on saddles, we will issue you a 100% merchandise credit if the saddle is returned within 30 days. Even if we have custom adjusted the tree to your horse, we will still take the saddle back for exchange. 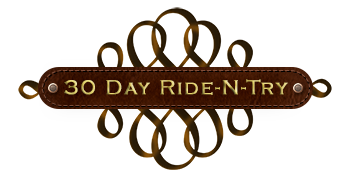 Our Ride-n-Try program allows the rider to really experience the feel of the saddle. This takes longer than 3 days to decide so we offer a full 30 days! If you decide you love the saddle, then you can keep it! Don’t like it? Exchange it for another! No catch. We want you to get a saddle you feel safe on and enjoy. Do you only have one or two models available to try? No! We have a great selection of most models we offer. Give us a call now and let's get you back on the horse! What if you custom adjust the tree to my horse? Yep, we will still take it back! So try the saddle you have been wanting...you have nothing to lose! Plus, get TWO years of FREE tree adjustments on saddles over $1,295.00! We are concerned you get the saddle that really fits you and your horse. We will go out of our way to assure you are happy.